The moral of the saying is; changing something’s name does not change its inherent qualities. Perhaps somebody should mention that to Ask.com/Interactive Corp.
For years Ask.com/Interactive Corp has been enticing users into its web of adware riddled software and toolbars per medium of cutesy smileys and emoticons available through its pernicious FunWebProducts suite. As users’ awareness was raised by tech sites revealing the true nature of FunWebProducts, including such nefarious titles as MyEmailStationery and MyWebSearch, so the suite has ultimately waned in popularity, until nowadays we rarely hear of it. Not to be deterred, Ask.com/Interactive Corp figures they can overcome what can only be described as a less than stellar reputation by hiding behind a different name, Mindspark Interactive. Indeed, if you read through the information on Wikipedia pertaining to Mindspark Interactive, you’ll see a convoluted history of ownership and name changes. 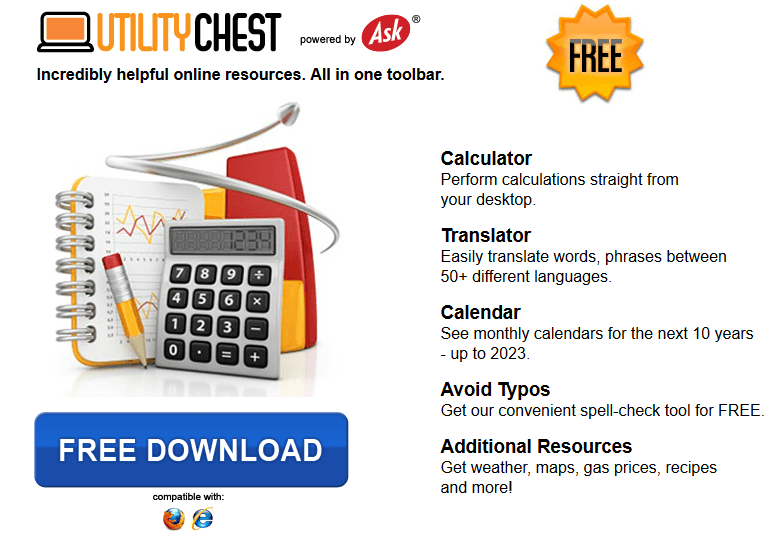 Which brings us to the latest suite of potentially nocent software from Ask.com/Interactive Corp called “Utility Chest”, which is being distributed under the Mindspark Interactive monicker. Make no mistake about it, this package actually comes from the same people whose previous offerings have been known to hook deep into the system, hijack browsers and search engines, and generally create a nuisance. The moral of this story is; don’t be fooled by the name change. If you come across Utility Chest from Mindspark, which is being advertized extensively on trusted sites, steer well clear. Oh, by the way, the official Utility Chest site is rated RED (as in high risk) by WOT – so you won’t find a link to it here. Hi Jim, reminds me of the Medicine Man who regularly changes the labels on his bottles of ‘cure-all’. Utility Chest would make a nice replacement for the Start button from your other article. FYI, I get a PAGE NOT FOUND for Ask.com/Interactive (as stated in your article). That isn’t a link it is demonstrating that Ask.com and Interactive Corp are the same company, organization, or at least closely related. Obfuscation & trickery is the new business model for the unwary. Almost every computer I have looked at over the last few years has unwanted tool bars, unwanted junk programs and search and home page hijack infestations. The old fashion viruses that used to infest most computers has pretty much been eliminated,but not entirely. Unfortunately most antivirus/anti spy programs quite happily allow computers to be infected by the new marketing scourge .. kindly referred to as PUP’S .. Many once trusted download sites are now an absolute minefield.